Brisbane Soloist / Duo 726 – Fronting several rock acts over the past 10 years, Brisbane Soloist / Duo 726 brings his awesome voice and guitar skills to an act which blows minds and has crowds wanting more every time. The duo option is adding a drummer. 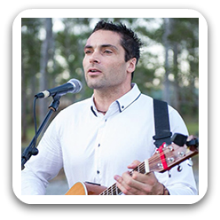 Can perform as a: Soloist, Duo and is available to perform in Brisbane, Gold Coast, Sunshine Coast and Surrounding Areas. Hi, Soloist 726 was excellent. He was professional friendly and entertained my guests so well that they asked how to get in touch with your web site.. The venue entertainment manager was also very impressed. Great decision to book this entertainer – he was awesome! Terrific song list, great sound and he did a brilliant job keeping our guests entertained. Thanks so much for helping our party be such a great success – everyone was very impressed! What a great day, and it always helps when you have some great music. I’m so glad we picked Soloist / Duo 726 to handle the music at our reception, Great voice, cool tunes and really friendly and helpful. We hired Soloist / Duo 726 as a duo with his mate, as percussionist. We would highly recommend them for anyone’s events, he has a fantastic voice and a great repertoire of songs. He even learnt a new one for us as it’s “our song”, thanks mate sounded fantastic. Also we found the Black tie group professional and approachable. We had originally made contact with a few other booking groups,they were found to be very slow on response, unable to supply artists or not even replying. Black Tie came up trumps on all levels. Once again thank you for helping us to have a beautiful, fun and enjoyable day. All the best Carl and Allison.